At Cogeco’s annual general meeting recently, I managed to borrow Cogeco Media president Richard Lachance for a brief conversation about the company’s plans in radio. At an earlier meeting with Cogeco CEO Louis Audet, the focus was on the cable and telecom side, and the radio division didn’t come up until I asked at the very end if there was anything new there. The truth is there isn’t. Cogeco hasn’t bought, sold or shut down a radio station in years, or even rebranded or reformatted. Its Rythme FM network has gained — and lost — some affiliates, but otherwise there has been little change in the past five years, following realignments that came from the Cogeco acquisition of Corus’s radio stations in Quebec. HD Radio: Cogeco’s FM transmitters are ready, or soon will be, to broadcast using HD Radio, a hybrid system that adds digital streams on top of the analog signal. Major broadcasters have been experimenting with it, mostly by simulcasting AM radio stations on FM HD (such as Bell is doing with CJAD and TSN 690 on their 107.3 signal). But Lachance was lukewarm on its appeal. Outside of cars, receivers are hard to come by, and demand isn’t that significant. And activating an HD signal has a negative effect on the power of the analog signal. Cogeco has experimented with an HD signal on CFGL-FM (Rythme FM 105.7), just rebroadcasting a digital version of the analog signal, but that’s no longer running. If Cogeco followed the path of its competitors, it could rebroadcast its AM station (CKAC Circulation 730) on an FM HD transmitter like 98.5 or 105.7, but there doesn’t seem to be a huge rush to do even that. CKOI: The days of Montreal’s most powerful radio transmitter are numbered. The 307,000-watt signal, grandfathered at that power when the federal government imposed a 100kW limit on FM stations in the 1960s, is being replaced by a new transmitter on the Mount Royal Antenna, that will be higher up but lower power (147kW) so its pattern doesn’t extend beyond its current one. Lachance said the plan is to make the move this year, probably around June. After that, the existing transmitter and antenna on the CIBC building at Peel St. and René-Lévesque Blvd. downtown will likely be torn down. CKOI’s backup transmitter, and others for Cogeco stations and some Bell stations, is in Laval’s Auteuil district. Most people won’t notice a change. But Cogeco believes the higher antenna will mean less interference from large buildings and the mountain itself. Other Cogeco stations have applied for and gotten permission to increase to the maximum 100kW. The transmitter for CHMP 98.5 has already been increased. The Beat 92.5 (CKBE-FM) remains at 41kW and its upgrade, though approved, isn’t scheduled in the short term. The CBC’s Mount Royal antenna tower hosts most major FM and TV transmitters in the city. All major commercial FM radio stations in Montreal except one broadcast from antennas on a single giant transmission tower at the top of Mount Royal. Soon, the sole holdout will be joining them. Last week, the CRTC approved (without any public process) an application to move CKOI-FM 96.9 from its current location atop the CIBC tower at Peel St. and René-Lévesque Blvd. to the Mount Royal tower. Cogeco’s application explains that, with the move of television stations to digital, and the channel change of Radio-Canada and CBC TV transmitters from 2 to 19 and 6 to 21, respectively, the old VHF TV antenna used by them has become obsolete and is being removed. That will open up a space for a new antenna, and Cogeco wants to install it. There are a few benefits to this. One, Cogeco’s other FM stations (CFGL-FM 105.7 and CHMP-FM 98.5) already broadcast from the Mount Royal tower, and moving CKOI would allow all three to be managed from one site, the company says. Also, because the antenna would be higher (277.6m instead of 220.8m above average terrain), its transmitter can reduce power but still cover the same area. Finally, Cogeco says the new antenna will be compatible with HD Radio. It’s unclear if Cogeco has immediate plans for HD Radio or if it’s more of a long-term option, but other broadcasters are starting to use it now and CKOI would be ideal both because of its high coverage and because there are no stations close to it in frequency. What makes CKOI unique in Montreal isn’t just its location, but also its power. According to the Canadian Communications Foundation, the station was authorized to use 307 kilowatts of power in 1962, when commercial FM broadcasting was just beginning in the country (at the time, the station was CKVL-FM, and was transitioning from being a mere repeater of CKVL to having its own programming). Because of grandfathered rights, it got to keep that power level even though FM stations are now limited to a maximum of 100kW. CKOI is one of only five stations in Canada allowed to go beyond 100kW, and it’s the second-most powerful transmitter in the country after Winnipeg’s CJKR-FM (310kW). The grandfathered rights, however, don’t mean CKOI can move to the Mount Royal tower and blast out 307kW. 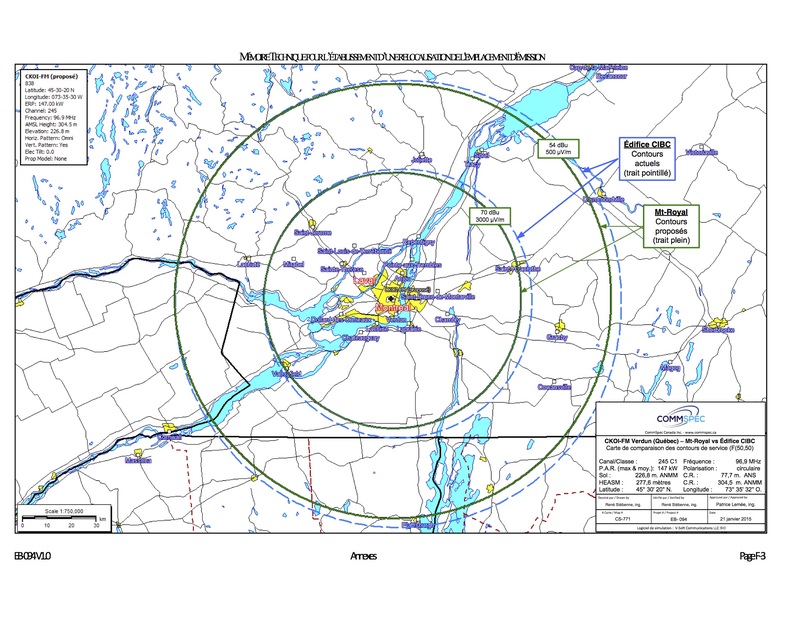 When asked to approve the change, Industry Canada (or whatever it’s called now) said CKOI could continue exceeding the 100kW maximum provided its coverage area did not increase, that there was no increase in interference to existing stations or aircraft navigation, that the new installation respects safety regulations relating to transmission power, and that there is no objection from the U.S. Federal Communications Commission. The new pattern slightly reduces how far the signal goes toward the east and south, but probably won’t be too noticeable. (Cogeco estimates that 99.6% of the population in the previous coverage area will still be in the new one.) The higher antenna height will also mean the signal will face less disruption from the mountain and tall buildings. As a bonus, people going through central downtown won’t have their FM radios so overloaded by a 307kW transmission just above their heads that they hear CKOI all over the FM band.